Let SPES come to your school. Although we offer schools outdoor field trips year-round, when rainy season begins, we deliver interactive and educational programs right inside your classroom. 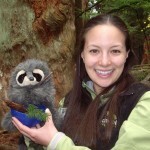 We use creative storytelling, puppets, games and engaging props to connect students with nature. Environmental learning has never been so much fun. Meet Rachel Raccoon, an urban dweller who wants to get back to her wild roots. Young students will learn about the needs of plants and animals through creative storytelling, imaginative play and interacting with educational props. Join us and discover how our personal actions contribute to healthy ecosystems. 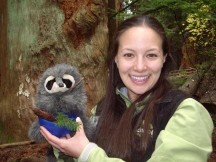 For grades K-1, Our Living Planet is $189.00 for a one hour program for up to 25 students. Can be adapted for pre-k as well. Download [Download not found] for information on curriculum connections, preparing for the program and more. Help Zorbo, a visitor form the planet Zorbonia, discover the amazing connections between salmon and our forests. How do salmon help the soil and trees? How do they know which stream to return to? Play salmon lottery, dress like a tree and find out how salmon contribute to healthy food webs. For grades 2-3, Salmon Forest is $189 for a one hour program for up to 25 students. Download the [Download not found] for information on curriculum connections, preparing for the program and more.